The rapid progression in technology and the cheaper prices have made it easier for kids as young as 13 years of age to own an Android mobile device. Parents consider that taking the cell phone away can minimise the negative effects of digital media. But, in reality, your child needs to have a mobile device nowadays considering the safety issues and the need for staying in touch with parents. To keep their children restricted from getting involved in dangerous activities online, parents need to educate their kids regarding safe digital conduct. Dark Side Of An Android Mobile Device. 1. View Contacts, Call logs and SMS History. 2. Keep an Eye on Installed Apps. Following are the few factors which leave negative impacts on your child. By identifying these risks, parents can help their children stay safe. Cyberbullying is certainly the most common thing among children nowadays. When you allow your child to take his/her cell phone to school, make sure you teach appropriate cell phone etiquettes to your kid. Most kids capture pictures of other kids or teachers without their consent and upload these pictures on social media to make fun of them. Bullying can be very disturbing for the positive personality development of both the bully and the victim. When you let your child own an Android mobile device, make sure you keep your child safe from sexting. Sexting has become a major parenting concern because more and more teenagers are getting involved in sexting. Most gaming apps promote violent or sexual content and leave a damaging effect on a child’s brain. Make sure your child only plays appropriate games on his/her Android device. An excessive use of social networking sites can make your child exposed to strangers who can be online predators or criminal minded people. Teach your child to change his/her password every once in a while to avoid hackers. Developers have specifically developed Android parental control apps to allow parents to ensure a safe use of Android mobile devices. The FamilyTime parental control app is the app that helps parents monitor their kid’s digital use and maintain a proportionate screen time for their kids. 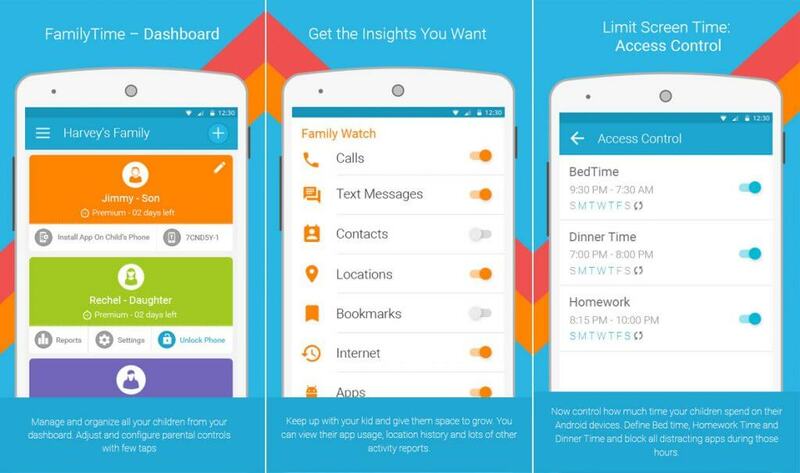 Using the FamilyTime parental control app for Android, parents can mirror the contact book of their kids, their call logs and SMS history with the date and time stamps and all available information on their own device. Not only this, if they find any contact suspicious, they can also put it to their Watchlist and receive instant alerts whenever the contact is made by either party either through SMS or call. Addicting apps can be devastating for your child’s physical health. By using FamilyTime, you can view the list of installed apps on your kid’s mobile device.with their related details such as the version of the app being used by the kid, date of installing the app, category of the app, etc. Parents can even view the app usage frequency too in order to know the time their kids spend on each app. This gives you an idea about the apps which consume most of your child’s time. FamilyTime allows parents to simply block a questionable and addicting app on their child’s cell phone. FamilyTime lets parents view the browsing history of kids with details of URL and time of visit. With that, they can check the bookmarks and favourites in the browser. Parents can announce a limited screen time by scheduling an auto lock on their child’s phone. Using FamilyTime, you can even lock your child’s phone at any time of the day. There is a lot more that parents can do with this app. So, give FamilyTime app a free try by downloading it from the app store on your phone.